The KoMo Medium grinder offers beautifully clean lines and excellent grain milling performance. The KoMo Medium grinder offers beautifully clean lines and excellent grain milling performance. Inside its beechwood veneer cabinet is an exceptionally advanced, yet beautifully simple, milling mechanism. Precisely fitted corundum-ceramic burrs grind to any texture you choose, from exceedingly fine flour to coarse meal or cracked grain. All by simply rotating the hopper to align with your choice on the front texture-setting scale. KoMo mills are equipped with specially developed electric motors that provide reliable, yet extremely quiet power. 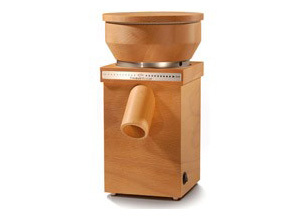 The KoMo Medium electric grain mill has a 360 watt motor. It produces 100g of flour per minute for bread flour texture. Dent (field) corn and soybeans can be ground to any texture from cracked to meal to very fine flour. For these very large-kerneled grains, grind first with the stones opened widely to produce cracked grain, then a second time if you want flour. The KoMo Medium will grind oats to a wonderfully soft, fine textured flour, but open the stones about five clicks (or so) wider than you would for a hard grain like wheat, otherwise the soft oat flour will fill the stones' furrows and in-feeding will stop. Opening the stones further will give you a cereal grind for porridge, or coarser yet for cracked oats, similar to steel-cut. KoMo grain mills are the product of collaboration between Wolfgang Mock of Germany and Peter Koidl of Austria, whose innovations have led to many advancements in modern grain mill design. As the exclusive U.S. importer of KoMo mills, Pleasant Hill Grain is proud to represent their fine European craftsmanship to our customers. We appreciate the performance and durability of KoMo's mills, and the sustainable harvest practices followed in the production of their beautiful beechwood cabinetry. Housing: 7 PlyBeech Wood treated with natural vegetable oils.